Saddle is NE of lake Fullsenn (908m), across to Fjelldokka. Climbed on skis 17 times in the Easter (first 1970, last 2015). How to get there: Most people access this mountain from the area near the lake Synnfjorden, it can also be accessed from the Valdres side. The road to Synnfjorden goes left from the road connecting Dokka and Lillehammer. Route description: Most people would ski this mountain from Synnfjorden, however this description starts at Åltjern where my hut is located. One can reach Åltjern by a nicely groomed ski trail from Nyseterhøgda on the Lillehammer to Dokka road, this would add about 20 km (easy skiing) to the trip. From Åltjern, ski across to Bleikeseter south-east of the mountain Prestekjerringa, then up to the saddle just south of this mountain. Continue along a marked trail down to Mjogsjøen and to the ski trail intersection called Kjettbjergkrysset, just north of the small summit Kjettbjerget. From here, along a marked trail to the Blesterseter overlooking the Dokka valley which is now destroyed by a hydro electric dam. In the spring the water reservoir is normally almost empty, with large ice blocks covering the slopes on both side of the valley. 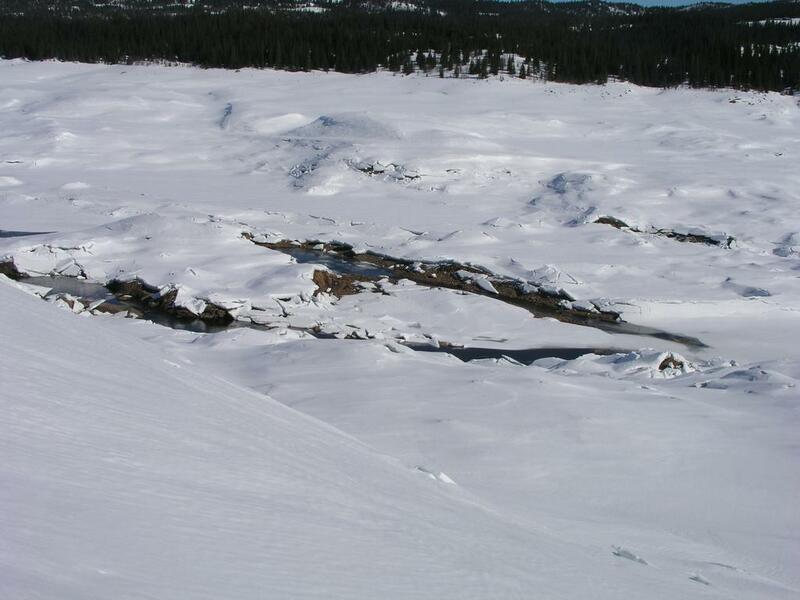 Carefully ("crevasse danger") ski down to the river or whatever remains of the lake and cross this on safe ice (check and probe carefully!) near the remains of the old wooden bridge. Climb steeply through a section of dense forest to the old seter called Goplseter. From here there is normally a ski track across to Synnfjorden. As one gains the top of the broad mountain slope south of Skjervungen one should find the trail that climb Skjervungen from the Synnfjorden area. Cross the road and the river Synna south of Synnfjorden and find the trail on an old road that climbs (sort of north) from the base of Synnfjell. From here there is a ski trail leading to the summit of Synnfjell, called Spåtind. The summit is quite some distance west after completing the first and steepest part of the ascent. Comments: I skied to this mountain 5 times with my father at Easter time. 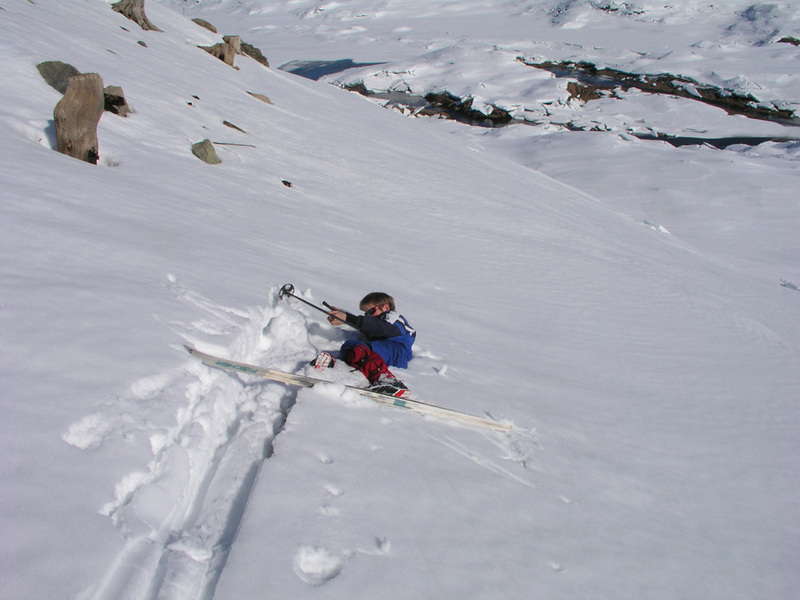 More recently I have skied with my son Tor Erling and already in the Easter of 2000 with Pål Jørgen (then age 11). 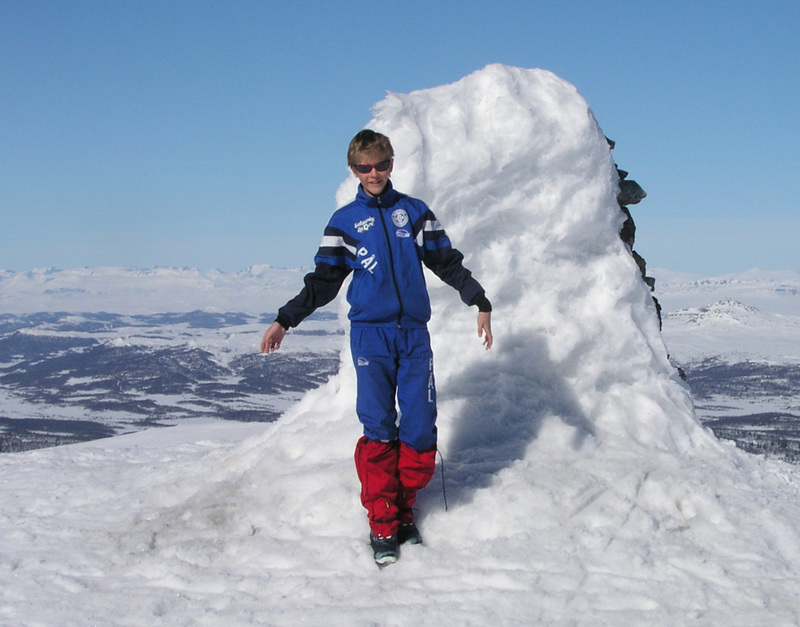 This trip is quite long with about 1600 meter vertical ascent and almost 60 km of skiing. Our two generation fastest time (one way) to the summit is 3 hours and 24 minutes in 2014. The previous fastest time was 42 years earlier in 1972, with my Dad. The Dokka valley has been turned into a hydro power water reservoir since then, so times are not quite comparable, we skied in exactly 4 hours in 2005 and in 2006. 1 March 25. 1970 4:00 8:30 With Dad. Used lift. 2 April 9. 1971 4:45 10:45 With Dad. 3 March 30. 1972 3:52 9:42 With Dad. First World Record. 4 April 22. 1973 4:30 11:00 With Jostein and Dad. 5 April 16. 1974 4:10 9:53 With Jostein and Dad. * April 8. 1978 5:00 9:55 Dad and dog Sam (I was in US). 6 April 3. 1996 5:00 10:55 With Tor Erling, age 14. Via Holsbru-Verskei-home. 7 April 7. 1998 4:04 7:46 With Tor Erling. 8 April 3. 1999 5:15 10:05 With Tor Erling. 9 April 19. 2000 5:30 10:45 With Pål Jørgen, age 11. 10 March 29. 2002 6:05 11:10 With Pål Jørgen and Tor Erling, via Spåtind hotel. 11 April 15. 2003 4:55 12:45 With Pål Jørgen, via Snuen, 80km. 12 March 27. 2005 4:00 8:17 With Pål Jørgen. 13 April 15. 2006 4:00 7:46 With Pål Jørgen. 14 April 10. 2009 4:35 8:30 With Pål Jørgen. 15 March 28 2013 4:25 8:05 With Pål Jørgen. 16 April 18 2014 3:24 7:08 With Pål Jørgen. New World Record! 17 April 3 2015 4:20 8:25 With Pål Jørgen. 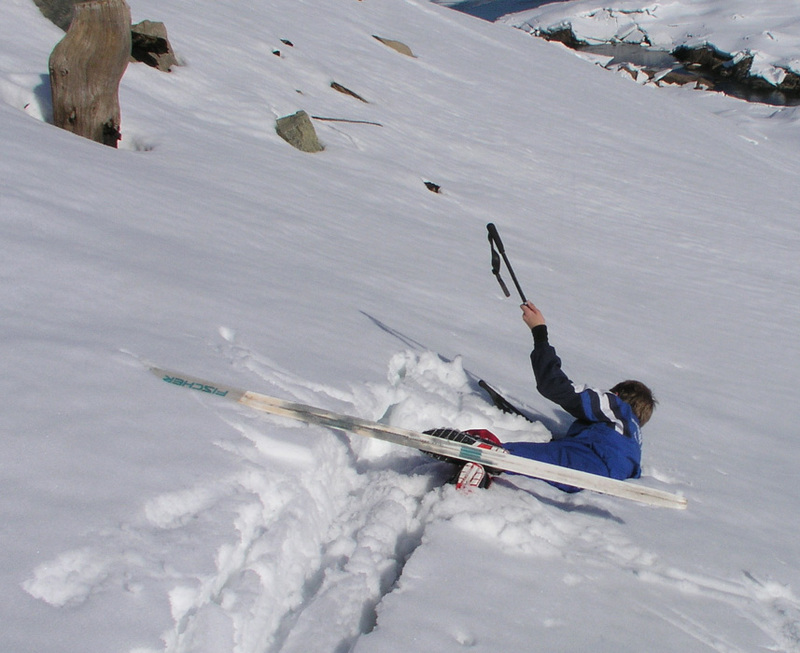 Winter conditions, break trail across Dokka. Synnfjell, as seen from Skjellbreidfjellet. The highest summit, Spåtind, 1414m, is in the far distance. Pål Jørgen breaking through rotten snow, this is the descent into and across the Dokka hydro power reservoir. A struggle, to get back up with this kind of conditions. The Dokka reservoir is always near empty at Easter time. Care is neeed with open water, unsafe ice and "crevasses" that forms as the ice breaks when the water level is lowered. Summit panorama, the view is west to north (large file). Summit panorama continued, the view is north to east (large file).